Once in the morning immediately after you wake up and are still on bed. Second time at night right before you sleep. As soon as you open your eyes in the morning and become aware of surroundings, Do not rush and get out of the bed. But stay there, close your eyes and because this is the time the whole humanity is awakening along with you, and there is a tremendous energy, just try, try and Imagine the whole world waking up ( Your eyes are still closed) . Now Imagine a beautiful golden sun on top of your head, make a copy of that Image and move the second copy of that golden sun inside your skull, see it, feel it and Imagine it. 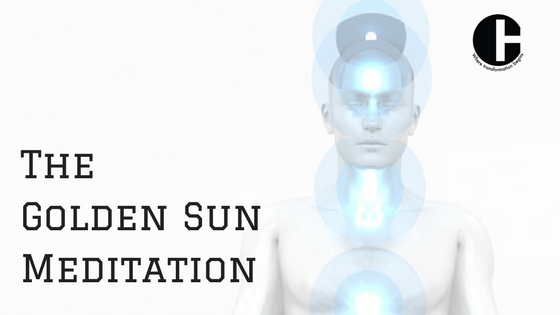 Now you have two golden sun’s , one on top of your head and the other inside your head. Make another copy of the sun and move it on to your Throat, and continue to repeat the process and leave each Image. Create golden yellow sun on Heart, stomach, Navel, Pubic bone, Knees and feet. Now your whole body is filled with golden light that is radiating from the Images of the sun, Don’t think anything Just Imagine and feel the light extend all around you to 3 feet front of the body, side of the body and back of the body. Your eyes are still closed, Just mentally spread your awareness and feel the light extending in to the whole room. Stay there and then slowly open your eyes. Rub your hands, make them slightly warm and keep it on your face and NOW start your day. Lie down on the bed and relax for a few minutes, after few minutes when you find yourself moving in to your sleep, then repeat the above process. If you fall asleep doing this, it is perfectly alright. You subconscious mind will continue and finish the meditation anyway. The key for this powerful meditation is to do it every day for 21 days. Then people around you will start noticing a GLOW or some kind of RADIANCE.